Buongiorno! Last month I had the pleasure of being able to visit Rome with my good friend Amber. I had some reservations about the trip beforehand because back in 2013 I went to Rome and Florence with my dad and didn't have the greatest of travel experiences. But now I'm older and have travelled a lot more since then and am more comfortable doing it. We ended up having a tremendous time, and we left feeling extremely fulfilled in having done everything we wanted to do. My one regret is not buying a pair of shoes I found there; they weren't cheap, but now I can't find them anywhere online and can't stop thinking about them. I guess this means I'll just have to go back to Rome soon than expected! Here are some things we did while there, including where we stayed, what we saw, and where we ate. 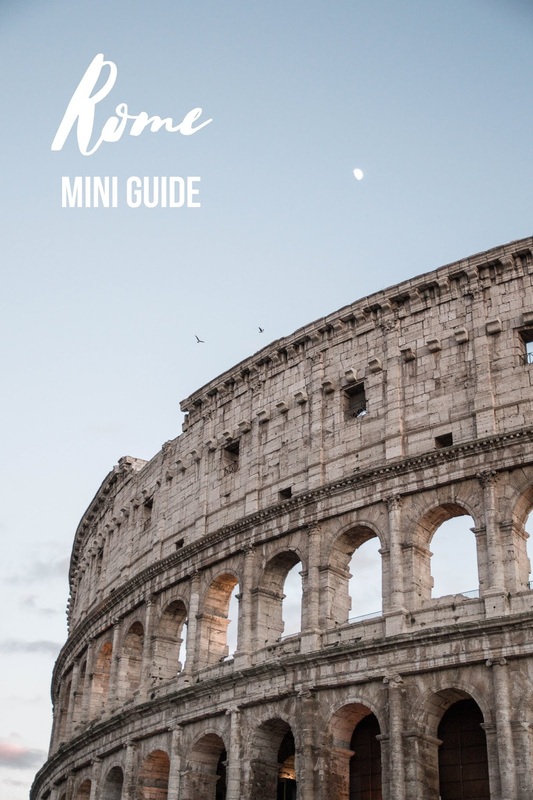 Nothing is sponsored, I just want everyone to be able to experience Rome the best they can, and these are the few tips I have! Although the best tip I can give is, if you can, visit Rome in January! I think part of the reason I didn't enjoy my first trip to Rome as much as I thought I would was because we went in July. Not only is July the hottest month of the year there, but it's also peak tourist season. Everything will be 10x as crowded, and anyone who gets claustrophobic easily in crowds, it's not fun. Whereas in January, it's still plenty warm (at least for me, but I come from a cold place), and nothing is as crowded. If January doesn't work, do what you can to go during off season whilst also avoiding the Easter period. When booking this with my friend Amber, we booked it on one of those sites where you can package your flight and hotel. Not really wanting to stay at a hostel to begin with, this turned out great as most of the options on the site are hotels. We both had an idea of where we didn't want to stay based on previous experiences, and eventually we came across this option of the Hotel Concordia. Even though it had mixed reviews on trip advisor, its location looked good enough that we decided to risk it. Let me just say that it was 100% worth the risk. The hotel had very accommodating staff, recently renovated rooms, a nice breakfast, and a rooftop with gorgeous views of the city. Our room was plenty big enough for the both of us, and it had a huge bathroom. But the best part? We had our own balcony! The only possible negative thing I can think of is that their elevator is tiny and can only fit one person at a time. It wasn't a huge issue for us as Amber doesn't really care for lifts to begin with, so we'd usually take the stairs anyway. In addition to how great the hotel was on its own, the location could not have been better. We were able to walk everywhere and didn't need to take public transport or cabs even once (other than to and from the airport), with the Trevi Fountain only being a five minute walk away! We would definitely stay there again. Seeing the Vatican was something I had been wanting to do since I first visited Rome when I was 16. Before going, I had been reading things and watching vlogs with people saying how busy it can be and lots of reiterations of buying tickets online. So we decided to do just that, and I bought tickets through TripAdvisor. The thing I didn't account for, however, is that all of those other blogs and vlogs were written during the summer... not January. There were virtually no lines when we went. That being said, I'm still glad we bought tickets ahead of time as there were tons of people lurking on the street asking if you had already bought tickets, hoping you hadn't so they could sell you (potentially fake) ones. The only issue we had is the tickets we had didn't say where to meet to collect your tickets. We found a few official looking people who all told us slightly different locations, but eventually we found our group a bit further away than we were expecting. 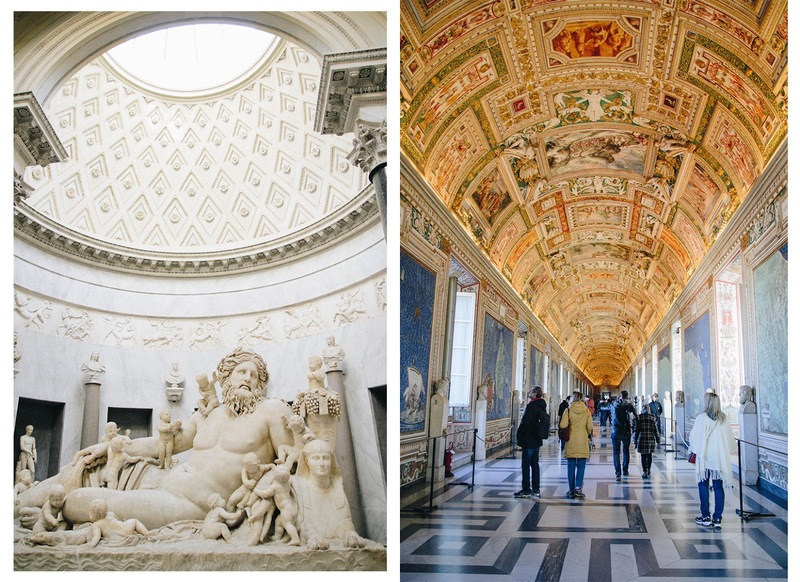 The ticket gets you in to the Vatican Museums and the Sistine Chapel. 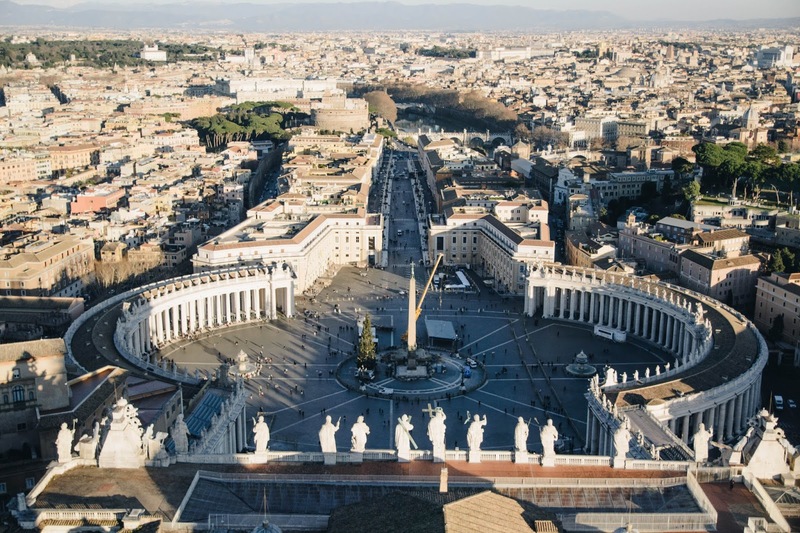 St. Peter's Basilica isn't included with that ticket, but it's free to see. The only thing is that you have to re-queue to get into the basilica, and during the summer that line can be terribly long. We had walked to the Vatican from our hotel, which wasn't at all a hard walk, but it took us nearly an hour. So by the time we got there, got our tickets, and went through security, we decided that lunch had to be first on our to-do list or else we'd be too hungry to enjoy anything. The Vatican has a few lunch options throughout, and where we ate wasn't as expensive as we were expecting with it being only €8 for a large (and I mean large) slice of pizza, fries, and a drink. The Sistine Chapel is at the very end of the tour, and unfortunately there are no photos allowed to be taken inside. The rest of the museum, though, photos are fine. 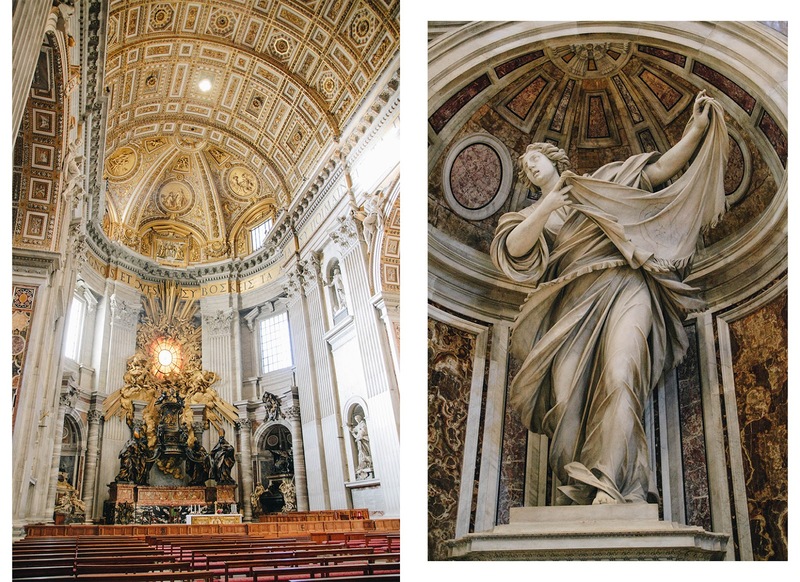 One thing to note is that if you are a part of an official tour, you can go directly from the Chapel to St. Peter's without having to re-queue. Also, make sure when you're visiting that you're properly dressed. Women have to have their shoulders and knees covered. As it was January, it was really an issue for us, but I can definitely see how it would be hard during the summer. Yes, I know that St. Peter's is technically still in Vatican City, but in a certain sense, it feels separate. However you get into the basilica, it's 100% worth it, in my opinion. I found the interior breathtaking with its incredible sculptures and endlessly tall ceilings. One thing that I never realized you could do, though, is actually walk to the very top. When Amber was in Rome a few years ago, she passed up to opportunity to do it and regretted it. Though it wasn't something I would normally think to do, it sounded cool and agreed to do it. Remember how I said earlier that she doesn't like lifts? Well, to get to the top, it's 551 steps. You can take an elevator half way up and then stairs are the only way to the very top. Since she doesn't like lifts, we walked all 551 steps. I was a hot sweaty mess by the time we finally reached the top and finished two entire bottles of water. The views were amazing, but get the lift if you can. Your legs will thank you. 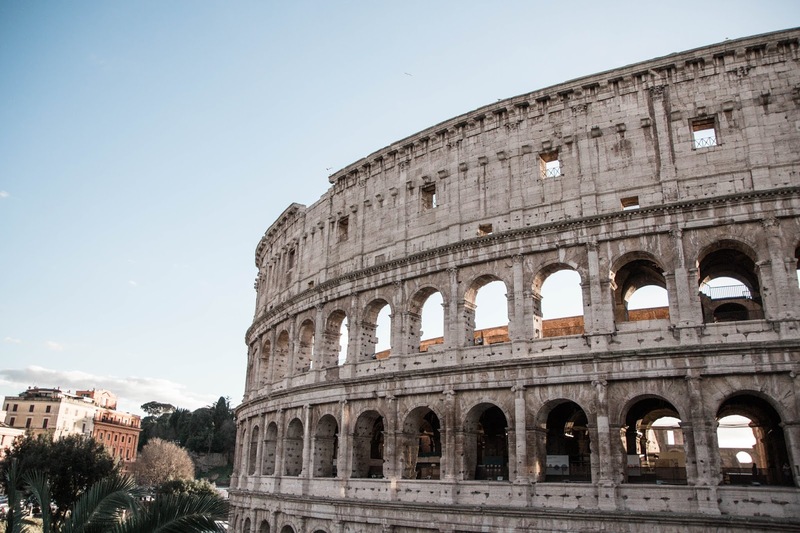 Is there anything more iconic in Rome than the Colosseum? Another thing that I missed out on actually doing my first time around in Rome a few years ago, I insisted that we go inside. 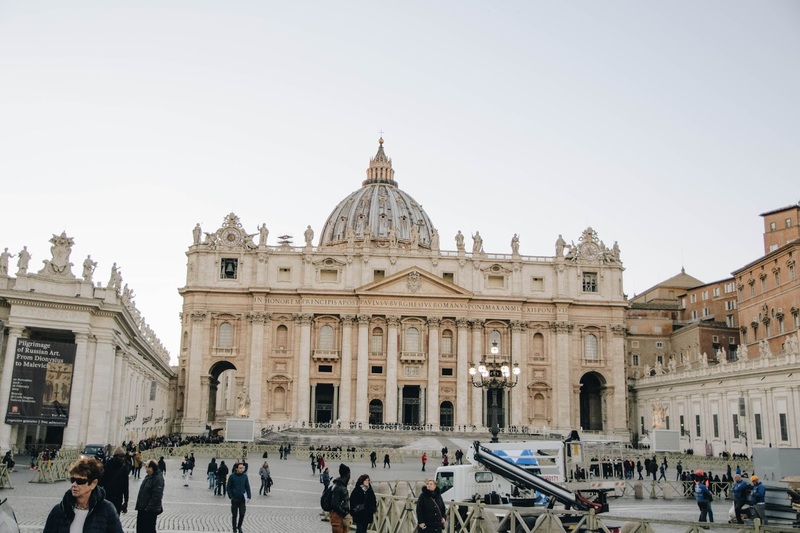 After having gone to the Vatican the day before, we once again decided to buy our tickets ahead of time online as to best avoid any suspicious sellers outside of it. They seem to leave you alone rather quickly if you tell them you already have tickets. It was another good call, as the Colosseum was a bit crowded but we were able to skip the line since we already had our tickets. 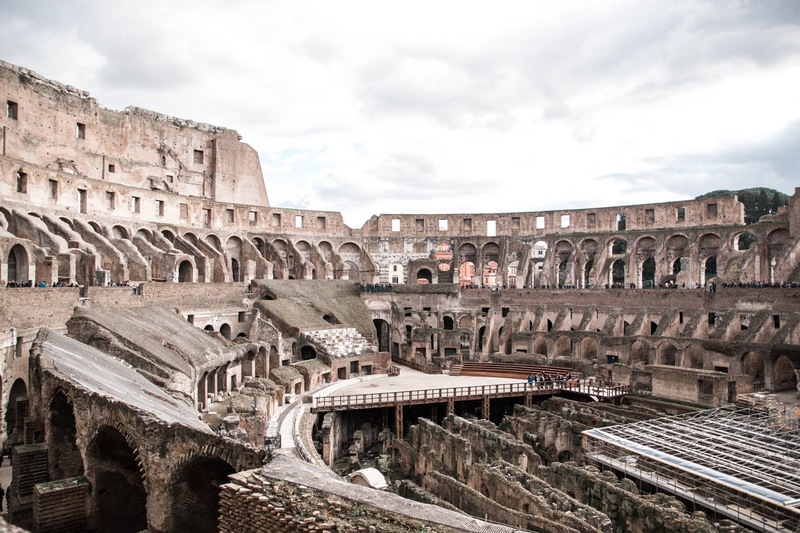 It it weren't for all the other people around, stepping inside the Colosseum feels like being transported back in time. I've never been in anything quite like it, and it's truly remarkable that something as old as this is still standing. Inside they also have, what I would call, a mini museum with lots of information about the Colosseum along with mini models and other Roman artifacts. We opted to just roam around ourselves rather than have a tour, and tickets came to €18 each. Yes, it's one of the most touristy things to do, but I strongly feel that everyone should visit this once if they can. 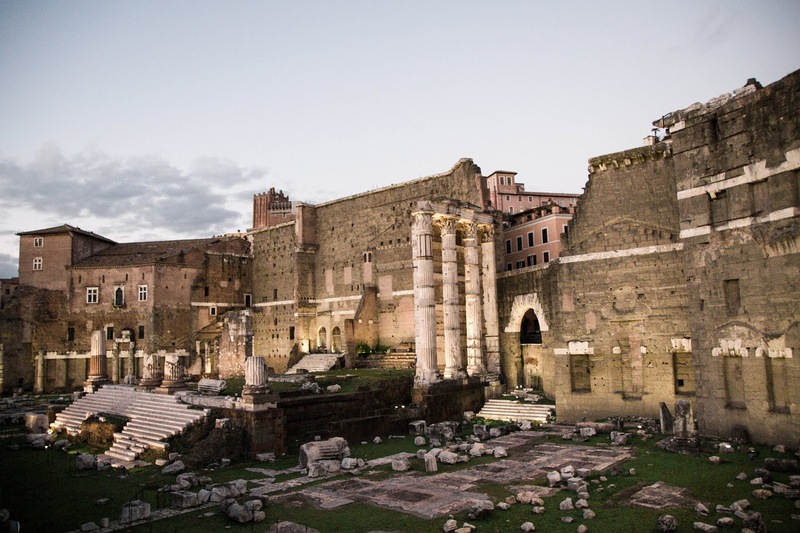 When walking to the Colosseum, you'll walk by a number of ruins that remain from the ancient city. Though there are a lot of selfie stick/scarf/rose sellers who roam throughout, it's still worth stopping by and admiring the views. There aren't many places left in the world that still have remains of empires gone by. You can also walk up a hill right next to the Colosseum that gives you some nice views of the city. Though it was partly locked when we were there (it was already late in the evening), it looks like there's a nice park with lots of benches where people can sit and relax. But at the top of the hill, we did see a nice church. It's small and intimate but gorgeous none the less. If you have 45-60 minutes to kill before your Colosseum reservation, this is the perfect place to see. I'm sure I can't be the only person who saw the film Angels & Demons and wanted to visit this Piazza afterwards? Yes, the piazza where the antagonist tried to drown someone. Anyway, I remember watching it and wanting to see it for myself. 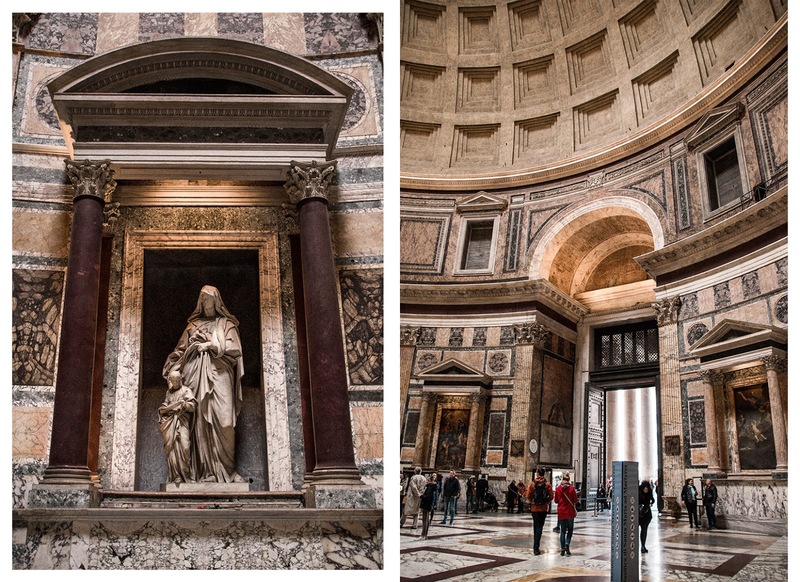 I was able to see it for the first time a few years ago on my first visit to Rome, and with its close proximity to the Pantheon - where Amber and I were already planning on going - we were able to squeeze in a quick visit. 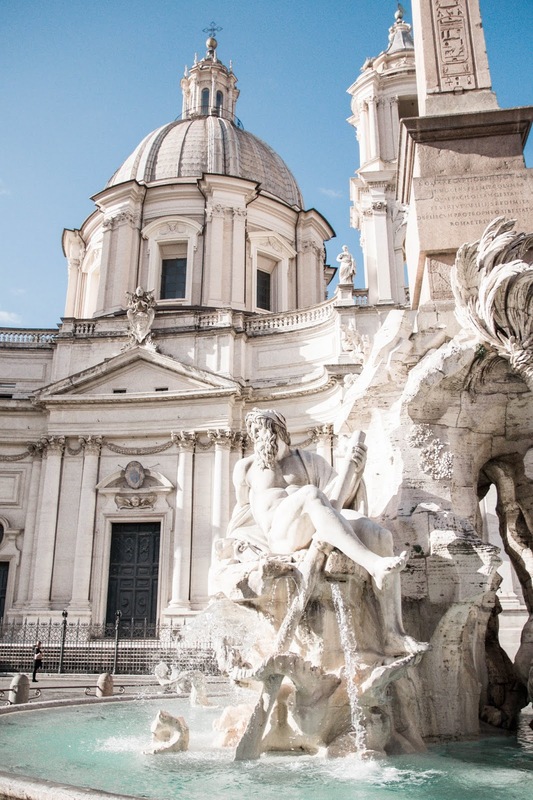 It's unfortunately become rather touristy in the past few years with selfie stick sellers constantly lurking about, but I just can't get over the Bernini sculpture fountain in the middle of the piazza. I think it will always take my breath away. There are also some great places to eat around the area. Just outside of the piazza we had lunch where I had a delicious ham and cheese calzone. Back in the piazza, we found a gelato place with tons of flavor options and even pastries for anyone who doesn't want ice cream. Have you ever had one of those experiences where you're looking for a place, and it's nowhere in sight, when suddenly you turn a corner and the entire thing just appears before you? That's basically what happened to us when looking for the Pantheon. 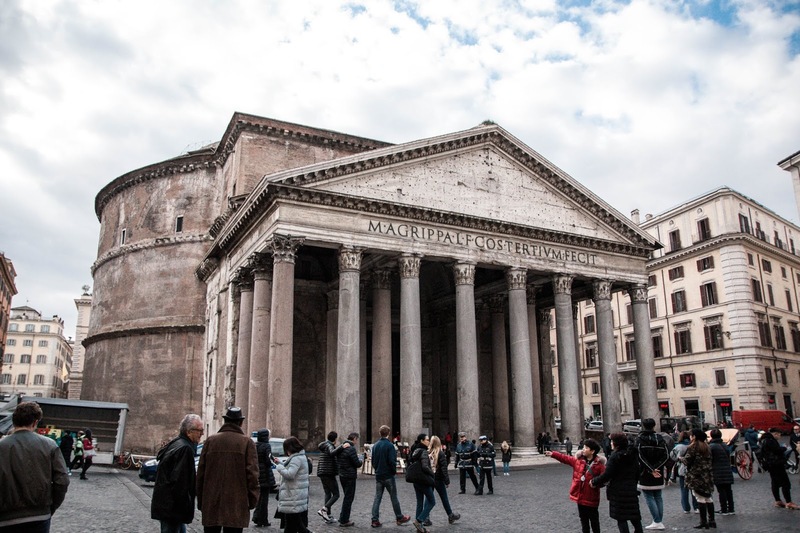 The Pantheon is a grand building that sits openly in the middle of a square. How we managed to go so long without seeing even a piece of it still astounds us. 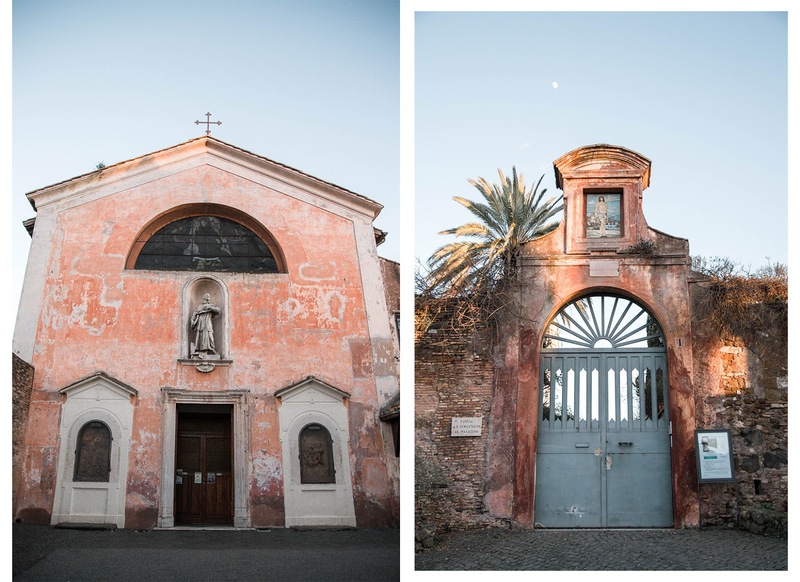 This former Roman temple is now a church, however there is free entry to tourists. The day we went we were once again lucky and were able to walk straight inside. Once inside, your eyes immediately go straight up to find the endlessly high ceiling is actually a dome with an oculus at the top which gives the only source of light. It's not huge inside, and depending on how intense you are about reading the descriptions under the artwork, you can finish seeing it all in less than an hour. 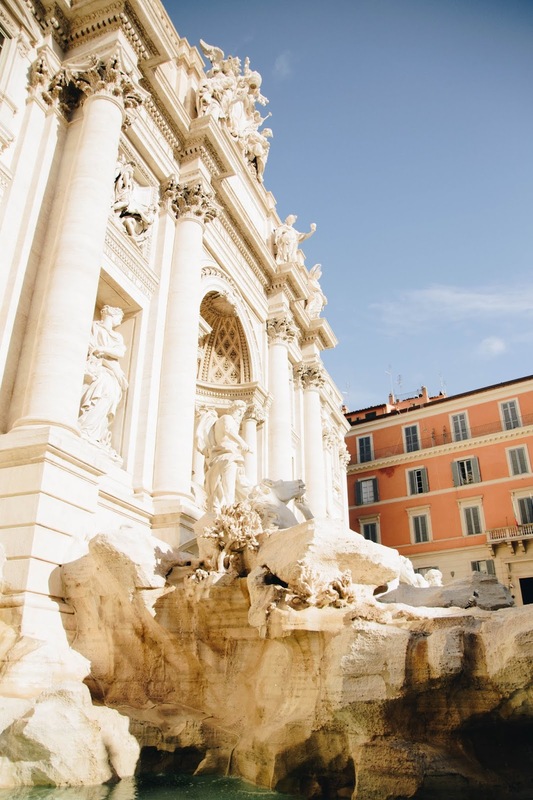 If you've seen the Lizzie McGuire Movie, you have to come here (seriously, you wouldn't believe how many times I heard Lizzie McGuire mentioned despite the film being released in 2003). Though terribly crowded - more crowded than any other attraction in Rome in my opinion - the fountain itself is said to be lucky. 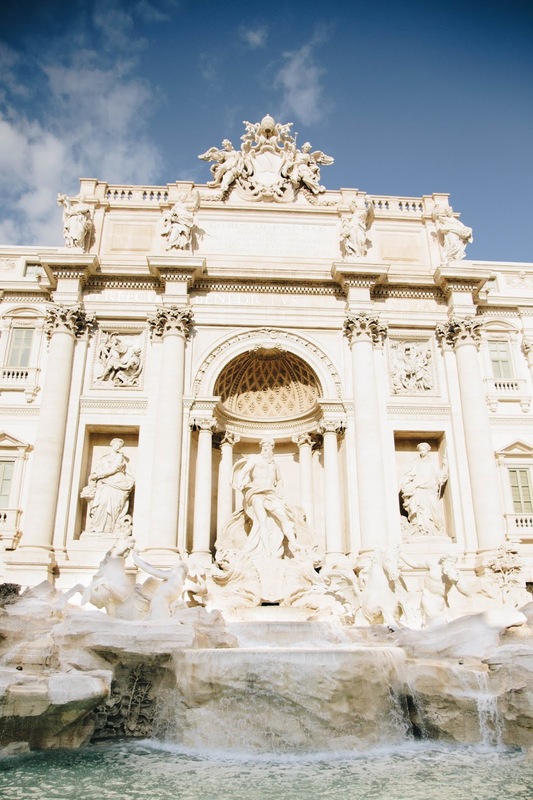 Designed by Salvi and influenced by Bernini, it was completed in 1762 and is Rome's largest Baroque fountain. Definitely be aware of your things when here; I wasn't pickpocketed during my trip luckily, but I was always most concerned about it here. However, we found that it was usually much less crowded in the mornings, and since we pretty much had to walk past it to get anywhere from our hotel, we had a few chances to take pictures. And if the crowds get to be too much for you, there's another delicious gelato shop right there where you can pop in and get a nice pick me up. If you can get close enough, make sure to throw a coin in for good luck! 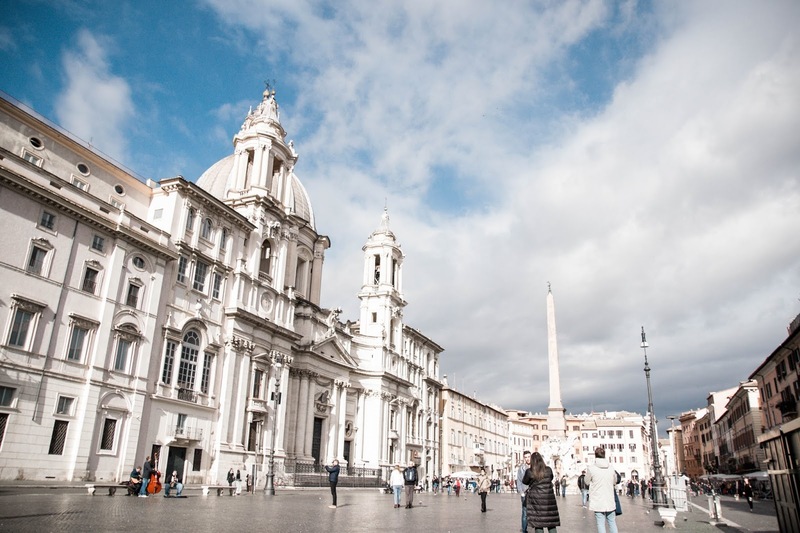 If you throw it over your left shoulder with your right hand and the coin goes in, legend has it that you'll definitely return to Rome again! Close to the Trevi Fountain, this restaurant is rather small, but the food packs a big flavor. Maybe not the best place for someone who gets claustrophobic easily as the tables are quite close to each other, but Amber and I didn't mind. It was English friendly, as most places in Rome are, and the food was great. I had the pasta carbonara and actually wasn't able to finish it all because it was so rich. That being said, I of course had enough room for dessert where I had the Italian equivalent to a Mille Feuille with fresh strawberries in it. On the same street as our hotel, we came upon this place on our way back from the Spanish Steps. We were attracted to it because we could see an old staircase and beautiful second floor from outside. When we saw that the prices weren't bad either we went in. I can't remember what exactly I had, but I know I had a pasta dish that I thoroughly enjoyed. The restaurant was remarkably empty despite having nice food and a gorgeous interior, but perhaps it's just because it's currently off season in Rome. This place was walking distance from the Colosseum, but also far enough away that the prices weren't bad. I enjoyed hand made pasta (are you seeing a theme here) whilst Amber had a pizza which I eventually stole a bite from. Both things tasted amazing, and we agreed that if we found ourselves in Rome again anytime soon we would try to come back here. I hope you've enjoyed this post! I'll actually be returning to Italy for another visit this summer, and after this trip I can't wait! 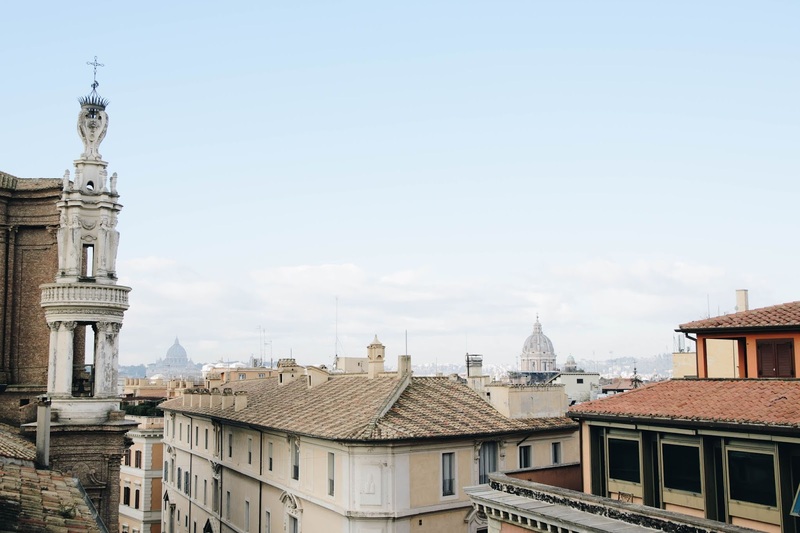 Have any of you been to Rome? Let me know about your experiences and tips in the comments!